Liturgical dancers at St. Paul’s work together to choreograph, practice, and present original works of worship to the congregation. We dance to music offered in a variety of presentations: contemporary Christian music, live choral and instrumental accompaniment, and traditional Christian music. Music is carefully selected in consultation with church leadership. We strive to create a loving environment where dancers can share their gifts with the congregation. Dancers enjoy individualized choreography based on ability level, group warm-up, and prayer at every practice, camaraderie, custom costumes, solo opportunities (by invitation only), supportive palanca, Heather’s famous cinnamon buns, and a river of God’s Love rushing over them during worship. Liturgical dance is a life-changing experience for many dancers--it also leaves a long lasting impression on the congregation. “Relevé” (pronounced rel • eh • vay) literally means “lifted” and in ballet is the rising up of the body, beginning from plié (plee • ā) and ending in a high demi-pointe. 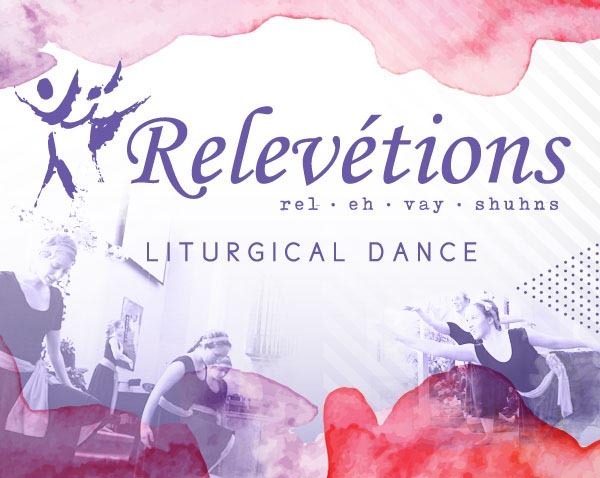 The name “Relevétions” for the liturgical dance group at St. Paul’s is thus symbolic of our need to be broken to God’s will before He will let us truly “rise up” and enjoy His perfect peace. Combining elements of classical ballet, modern, lyrical, jazz, sign language, and sometimes even ballroom dancing, Relevétions dancers worship Him through dance offered as a living prayer--a deeply spiritual, full-body, external expression of an inward desire to love the Lord with all our heart, soul, mind, and strength (Mark 12:30). While there is no minimum experience requirement, dancers are encouraged to take regular technique classes on their own for familiarity with terminology used during rehearsals and for personal injury prevention. We welcome men, women, girls, boys, teenagers, college students--anyone with a Love for the Lord and a Love for dance! Solo opportunities are available by invitation only; ensemble opportunities are open to all. Dancers may select their participation for the year as their schedule allows. We typically dance in the Sanctuary three to four times per year during the 9:15 and 10:45 am worship services. Rehearsals are scheduled in the month leading up to a dance offering, in the early afternoon on Sundays. There is one mandatory technical rehearsal in the Sanctuary before a dance offering, typically on a Friday evening. Dancers are permitted to miss one regular rehearsal for any given dance offering, but must attend the mandatory Sanctuary rehearsal and be punctual for practices. If you’d like to support the ministry, consider volunteering to help sew costumes, make headpieces, help out backstage, or provide snacks or baked goodies to keep dancers nourished between services! You may also make a monetary or in-kind (we love fabric!) donation to support the ministry. If you or your child would like to join Relevétions, please email Artistic Director Heather Sustersic.